What does every child want? The chance to kick a ball, to throw it well, to share that success with family members. What does every child with intellectual disabilities want? The exact same thing. Every day we work side-by-side to offer a variety of ways for everyone, regardless of ability/disability to learn, grow and to thrive in our programs, our community, and in life. Special Olympics Young Athletes is a sport and play program for children with and without intellectual disabilities, ages 2 to 7 years old. 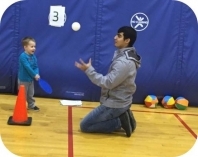 Young Athletes introduces basic sport skills, like running, kicking and throwing. Young Athletes offers families, teachers, and caregivers the chance to share the joy of sports with all children. Children of all abilities take part, and they all benefit. Young Athletes is easy to do and fun for all, and FREE. Through Young Athletes, all children, their families and people in the community can be a part of an inclusive team. Information and resources to register can be found below. 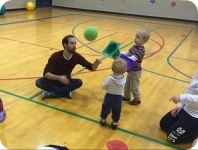 What: Fun and interactive program of activates to aid in the development of gross motor skills. What: Two hours a day of fun, games, education and fitness training. Earth Day: Gardening, Mission Nutrition, etc. Water Day: Sponges, squirt guns, popsicles, etc. Air Day: Parachutes, balloons, bubble, etc. How: Registration: $50 per individual for the entire week. Financial assistance is available.